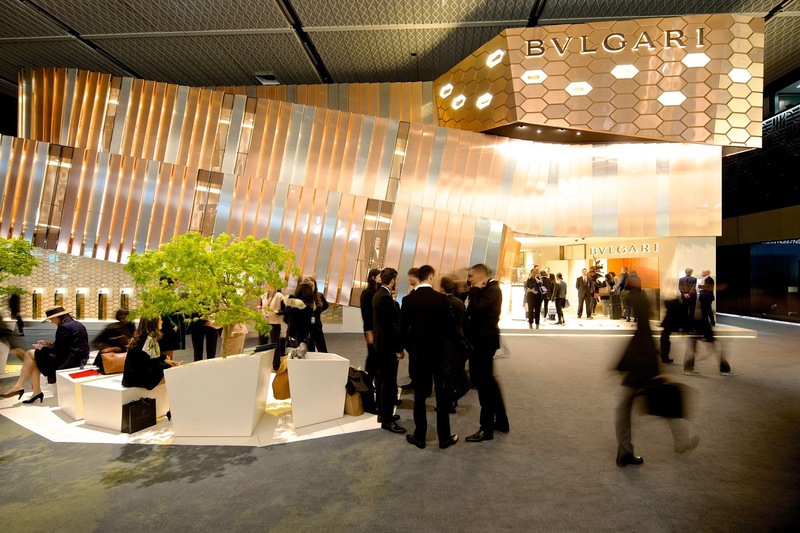 The world "show" fails to capture the grandeur, spectacle, and sheer decadence that is Baselworld 2014. But for convenience sake, I will simply refer to this short hand version for my report. This is my fourth full day at the "show," and I finally feel acclimated enough to give some impressions. First of all there is the sheer scale of this show in terms of physical size. Building 1 (the main exhibit hall) has three stories, with each story requiring ascent by two escalator flights. Each floor is like walking a shopping district in any major city, except each store is a watch or jewelry (or combination) establishment. Or maybe the sides are a representation of a watchband, who's to say. But these buildings are designed and built in great secrecy, and at a cost that I'm sure is into the millions of dollars. The exhibitor entry fee into the Main Exhibit Hall, street level, I'm told is $5 million, and then the exhibitor must build his pavilion in addition to that. The exterior walls of some pavilions are giant video screens, requiring an entire room inside the pavilion for computers and servers to keep the giant media presentation operational. Other pavilions, meanwhile, have restaurants with professional chefs to feed their staff and VIP guests. I can't help but be in a certain awe of all this high tech, style, and ingenuity. Yet the average show-goer seems fairly blasé about the whole thing, striding down the walkways of the exhibit hall as though it were an everyday occurrence. 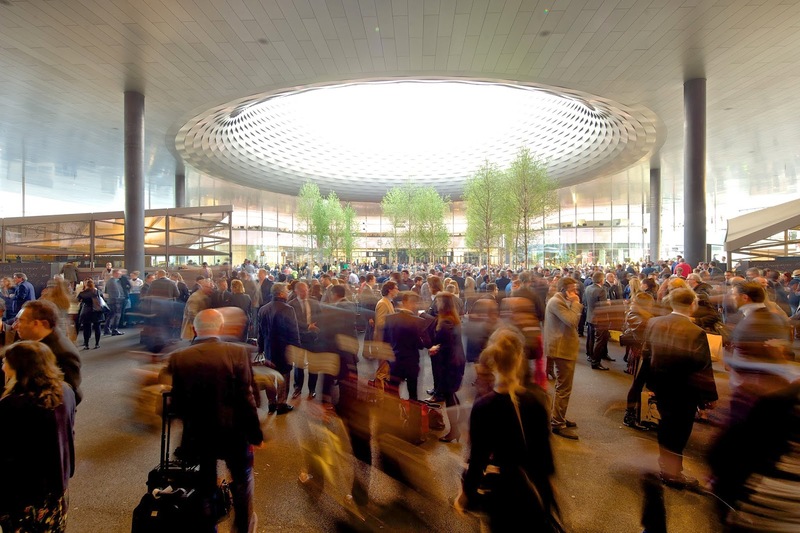 Then there is the whole central plaza, or "Messeplatz," which cuts through the main exhibit hall at street level and serves as the tram stop to deliver showgoers to and from the train stations and various other destinations throughout Basel. Beginning in 2013, it was covered, with a giant "doughnut hole" built into the middle, which serves as a skylight. 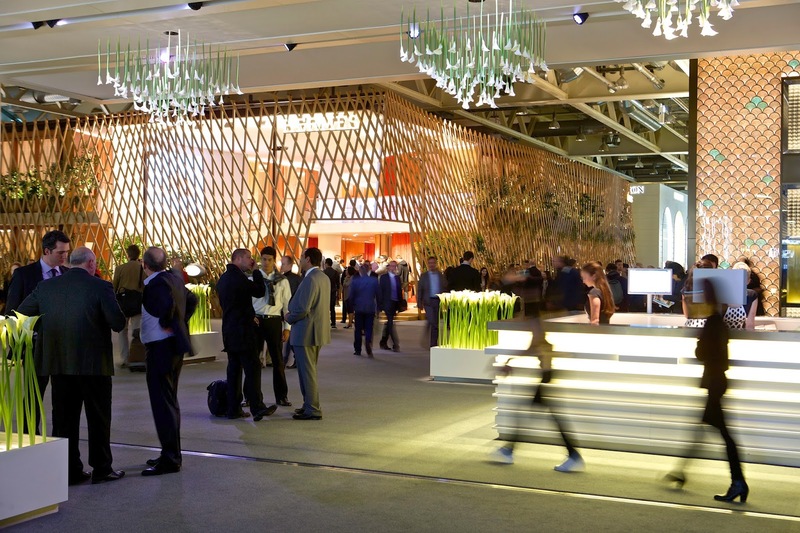 Unveiled at the show in 2013, it cost $365 million (comprising the largest chunk of a $500 million makeover of Hall 1). It was prebuilt in modules, and installed in less than 12 months after the closing of the 2012 show. The space above the new ceiling of the Messeplatz, on floors two and three, are now additional exhibition space. * Rooms at the Ramada Hotel, immediately adjacent to the fairgrounds, start at 640 Swiss francs (about $755 US) per night, and go up from there, and they are sold out. By comparison, my room at the InterCity Hotel in Freiburg, Germany is $148 per night, plus $58 daily round trip for the train ride to and from Basel. * the new buzzword this year is "Swissness," both a noun and adjective to designate a singular origin of a watch to Switzerland. The Swiss watch industry successfully petitioned the Swiss parliament to trademark the word, which will give the industry group the right to sue any non-Swiss company that might try to use the word. 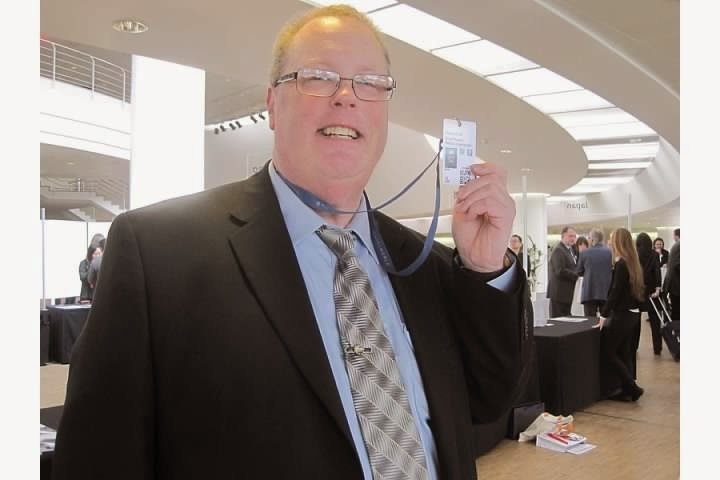 Finally, here is a photo of yours truly, a rare moment in a business suit, and holding my all-important media badge which gives access to the "media center," an oasis that affords me wi-fi access (where I am composing this entry now), bathrooms, snacks, and a multitude of caffeine-infused beverages. That's it for this installment. More to come, including brand impressions.